Overnight RV parking is OK. This is separate than the RV park, which charges a nightly fee. Not required. Usually there are RV spaces available. 12 full hook-up sites available for $20 a night (includes free drink and $5 in free play). 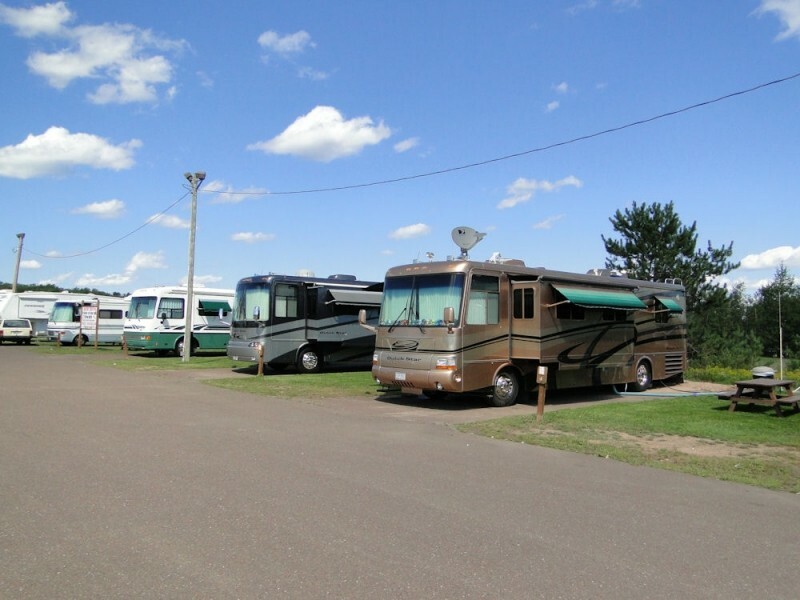 RV Park and Overnight RV Parking is also allowed. We attempted to stay at Porcupine Mtn and then Watersmeet Casino, both had no running water at the end of October. The female at reception was polite and helpful on the phone and during checkin. The $25 nightly fee was offset with two drinks and our $50 slot money. My husband won back and cashed out. We didn’t use the pool but had access to the sauna and bathrooms. We had paid $32 the night before at a State park that had lukewarm water and cold bathrooms. We stayed longer than expected & found it a very pleasant place. It wasn't ultra new & modern like others but it was clean & the help in all departments was accommodating. We were in the RV park & it was very nice with easy access & close to the casino. A little tip: if you expect rain the smaller the site# the more standing water it will have. We had a small # & standing water but what the heck we survived. S**t happens. Weak cell service, radio & Tv is not the casino's fault. We would return in a heartbeat. Hard to believe this is the same organization as in Marquette, MI. ! ! Baraga is $20 Fee for W/E/S which may not be bad but only one free slot play per person (a gip if you're only one person). NO TV what-so-ever, sparse radio and weak cell service. There is Free WiFi but pretty slow when people are active. Cable boxes along the back or rv sites, but front desk said they no longer work. RV sites are fairly level and large enough but I parked free for one night in the back on a gravel area along with a trucker. Just not as RV 'friendly' as their other location in Marquette, MI. Casino Extremely smokey and not very clean or attractive. There is a bowling alley and sports bar area separate from casino that was fun. The Ojibwa tribe also have a local campground elsewhere in town for $15 or head farther up the Keweenaw Peninsula for beautiful scenery. I would not recommend Baraga Ojibwa casino because of fee -- go back to Marquette ! There are twelve paved sites. I was told at the desk there are generally always 1 to 3 sites open every night so I believe you should always have a good chance of snagging a site. I didn't notice anyone staying in the parking lot but I'm guessing if you ask they would allow it. All sites are back-ins with sewer, electricity (50, 30 and 20 amps available), super great Wi-Fi, paved pads, and picnic tables. I believe they also have cable TV although I didn't notice the pedestal to connect to until I was leaving (and they didn't mention it at the desk so you might want to ask). I called ahead and was told to just take any open site and come in to the hotel desk to register. We stayed in about the middle and it was very quiet. I should also mention there are not a lot of trees so we had no problem getting a DirecTV satellite signal. If you stay closer to the highway you might here road traffic although it never seemed too busy to me. The cost was $20 per night but we did receive $5 in free play and a free drink ticket. I believe you get the $5 for each day you stay but you need to redeem it daily. We eat in the restaurant and it was very good and reasonably priced. We both thought the portions were very big. I had a salad and it would have been enough for a family of four. RV camping in the paved and level parking lot is OK overnight. They also have a campground with twelve sites. All sites are back-ins with 30 amp, water, sewer and cable for $20 a night.